Theme 3: Culture & Mindset - in a nutshell? Asked what enables or inhibits innovating for carbon reduction, participants in the research brainstormed and clustered their responses into 13 themes that seem to be important. I've been looking at this poster again these past few days as I prepare to do more work with Learning Histories at a local council. I wanted to get the essence of what was on there. 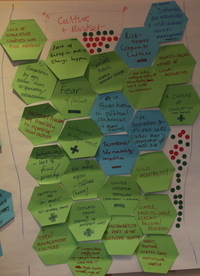 What key learning message/action point did it convey about the culture for innovation? So, to start with, I listed and categorised all the stickies that were on there into enabling factors (+) and inhibitors (-). Theme 3: Its message in a nutshell? "'For an innovative culture that will help to address climate change, organisations need to be open and willing to embrace risk and change but to do so in a co-operative, discerning & thoughtful way; attempts to bring about change need to be framed as thoughtful experiments that are celebrated for their potential rather than their outcome"
Does this description ring true I wondered - for the message on the poster and more generally for any organisation asking what is the culture for change and innovation? At the end of the story circle held at the Learning History workshop in Feb 2008, participants were asked to give each story they had told a title. And then each group (there were 5 in all) was asked if these stories were made into a book, what would it be called. 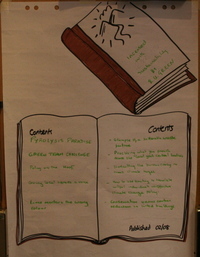 This group called their imaginary storybook - "Incensed by Sustainability". Here are their stories. The Green Team Challenge tells of how a team are currently trying to address waste in the offices of central government bodies and the challenges they face. Policy on the hoof tells of how, by gathering key politicians into a facilitated workshop setting, a group were able to get comitted buy-in to ambitious targets for carbon reduction. The process normally would have taken several months. Giving Local Heroes a Voice tells of how some wilful individuals with a keen interest in alternative energy got their voices heard by using the strutiny process. Lime Mortar's the wrong colour tells of how a Local Authority led a restoration project to show that conservation and carbon reduction can co-exist....well almost. What's striking about all these examples is how they echo many of the themes highlighted in the Learning Histories of the iconic examples featured in the research. In this set of stories the theme of champions and coalitions was particularly strong. Each and every example involved cross-department and partnership working beyond the boundaries of an individual's job. They also involved some passionate champions who were both technical (e.g. in Pyrolysis Parade) and political (Local Heroes and in Policy on the Hoof). Jessie Marcham, campaign co-ordinator, from Derbyshire County Council, was exactly the kind of 3rd party stakeholder that the research (via the workshop) was keen to reach out to . An overall purpose of the research was to amplify awareness about the featured examples. Like a handful of participants present Jessie was not that familiar with the examples featured: so the workshop was playing a part in spreading awareness of what can be achieved. 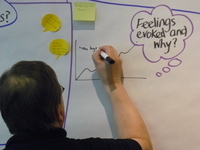 A purpose specific to the workshop itself was to create a collective learning environment in which new conversations and links might be created between participants. Again, like other participants, Jessie did not know many (if any) of the other attendees at the workshop. In a short snatched moment between exercises I asked Jessie how she was finding the process. Click on the audio play button below to hear what she said. Thurstan Crockett, head of sustainability and environmental policy at Brighton & Hove city council has been working hard to push low carbon work in his council. He became involved in the research back in May 2007 as the first active reader . This meant that he received Learning Histories as they were written and then he would actively read, comment and engage with them, looking for parallels in his own work. He reflected then as he went along how the process was making a difference to him. At the workshop, I collared him to ask him how he had found the process....click on the 'play' button below to hear what he said. Thurstan - the eponymous "Active Reader" reflects on the value in the research process and the difference between working 1:1 and in a workshop setting. 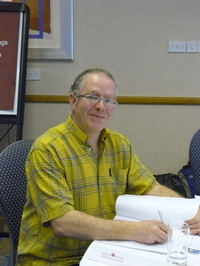 Steve Waller, sustainability adviser at the Improvement & Development agency for Local Government (I&DeA) has been involved in the research in two different capacities. 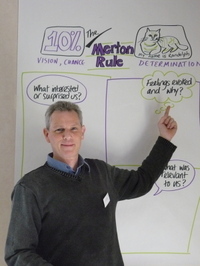 Formerly, from Nottingham City Council, Steve was instrumental in the creation of the Nottingham Declaration and therefore was a protagonist interviewed for that Learning History. Now at the IDeA his interests lie in exploring how knowledge and learning about sustainability can be shared across Local Government organisations. Recently Steve has been involved in the running of the "Tackling Climate Change" beacon scheme, where those councils who have made considerable strides in addressing the climate change agenda are elected as "Beacons". Toward lunchtime at the workshop I asked Steve how he was enjoying the workshop and his top of the head thoughts on the process of the research thus far. Click on the audio button below to hear what he said. ".....It's also been really good fun - this is a new way of doing things"
Do we have the time for setbacks & lulls? Change TAKES YEARS!! exclaimed one Nottingham Declaration reader. Frustration was a feeling noted by several active readers of the Learning Histories. There were many reasons for this frustration, but one source of it was the sense of urgency readers felt when they read about the long periods over which the successful projects described in the learning histories had been developed. "We don't have 20 years!" wrote one Barnsley reader - "We have 3!" "Argh! That started 20 years ago - we don't have time" - wrote a Southampton reader. Of Southampton another reader wrote: "It's clear that progress was not linear & there were setbacks and lulls". Another reader charted the highs and lows of the project to try to identify its key moments. A participant charts the highs and lows of the Southampton Learning History. How do we put together these 'highs' and 'lows' with the current felt urgency there is in tackling climate change? As urgency increases does the tolerance for lows and lulls become less? How are people experiencing lows? Do they recognise them at the time? When is a project dead? When is it worth persevering with? These questions seems to link to themes of determination and vision that have also been coming up in response to the learning history 'big read'. They also lead us close to what this research is about: faster, focussed and action-oriented learning that fits to the context of the learner rather than trying to replicate the circumstances of the innovator a theme I hope to develop a bit more. Active readers of the Southampton Learning History (which can be downloaded from our project website here). Have the problems with woodchip CHP been overcome? Were the ‘real’ risks and ‘perceived’ risks identified and analysed at the time? What complementary vision being played out in the private sector? There was some questioning around what it must have felt like to be involved. Was it pressurised? And how did local attitudes to the scheme change over time? Was there a trigger moment for Mike Smith that he hasn’t revealed when he moved from being purely concerned about the finances to the environment? These questions then led to deeper reflections on the success factors in Southampton. Just how did Southampton manage it, when Nottingham didn’t? How random was the EU funding? How could we challenge short-term market drivers? How do we work with personalities in a transient world where this is not encouraged for political and social reasons? And finally some reflective questions on our own practice, Are we honest about our own motivations? wondered the Southampton group. Would it make a difference to the outcome if we were?